18 days to Sydney, Tasmania, Kangaroo Island,the Outback and the Great Barrier Reef! Economy ClassDeparts late in the evening. You'll fly through the night, crossing the International Dateline, as the sun comes up you've skip a day ahead, arriving on DAY THREE. Surrounded by cosmopolitan cafes, bistros and restaurants, gyms and shopping, the Adina Apartment Hotel Sydney has every utility you may require for your stay in this energetic city. The hotel is ideally situated for exploring Sydney’s famous Darling Harbour, Circular Quay and The Rocks. Hop on the Sydney Highlights tour to experience the essentials of Sydney. We'll take you on a super easy ride featuring stunning harbour views as we pedal past Circular Quay, the piers at Walsh Bay, Darling Harbor, Hyde Park, and the Royal Botanic Gardens. There's no better way to get a quick feel for the city, than the Harbor Highlights Tour! Private lessons are great for those wanting lots of feedback, or for those wanting advanced or specific instruction. With a private lesson, the sky’s the limit. Plus with a dedicated instructor, you’re bound to learn at your fastest-possible pace. This is a place steeped in history – a place of wild and beautiful landscapes; friendly people; a temperate climate; and a relaxed island lifestyle. Tasmania is probably the best driving destination in Australia. Ideally located on the Hobart waterfront, Somerset on the Pier is an award winning transformation of the early 1930s pier building, offering breathtaking views of the River Derwent and Historic Sullivan's Cove. Somerset on the Pier is conveniently located just a few minutes walk from Salamanca Place, Battery Point and Hobart's Central Business District, so you can enjoy the city's finest restaurants and cafes, local galleries and craft shops, while exploring the natural beauty and charm. Bonorong Wildlife Sanctuary specializes in education, rehabilitation and release for orphaned and injured Tasmanian wildlife. Bonorong is now offering an experience found nowhere else in the world. This Behind the Scenes Keeper Day will give you a chance to experience unique Tasmanian wildlife face-to-face. Go inside the enclosures and see what is involved with day to day native animal husbandry; Daily health check and observation recording. Extensive session on Tasmanian Devils. Learn what is involved in caring for these amazing animals. Meet and learn their names, stories and personalities. If you are brave enough you may hand feed them and have photos taken less than one meter away from a devil! Amazing face-to-face photo opportunities with endangered animals including four species only found in Tasmania. Learn about orphaned and injured wildlife, first response medical attention, and orphan raising. Learn about the perils our animals face on a daily basis and what individuals can do to help. Spend a day on the Tasman Peninsula including guided return bus tour, three hour cruise, Port Arthur Historic Site, morning tea and lunch. This award-winning three hour wilderness and wildlife cruise takes you along the spectacular coastline between Eaglehawk Neck and Port Arthur. You will see Australia’s highest sea cliffs, enter deep sea caves and join in the search for abundant sea and coastal wildlife such as seals, dolphins and birds of prey. The custom built boats are ideal for viewing the spectacular coastline and wildlife with covered open-aired seating providing an excellent all round view and connection with the environment. After lunch, there is a three hour visit to the Port Arthur Historic Site before your guided trip back to Hobart. Kangaroo Island is regarded as the best location to see Australian wildlife in the wild. It is a destination of stunning scenery such as the Remarkable Rocks. It is a place you can come face to face with iconic Australian landscapes and friendly locals. The 'Ozone' is situated in an unsurpassed seafront setting on the foreshore of Kingscote, South Australia and was first opened in 1907. The Bistro offers local produce and seafood with some of the most spectacular views for a dining experience on the entire island. Visit Clifford’s Honey Farm, stop at Vivonne Bay is next for a spectacular free-flight display of Australian Birds of Prey. After lunch visit to the world famous Seal Bay where you will share one of Kangaroo Island’s greatest experiences - a guided beach walk among a rare and wild colony of Australian Sea Lions. After collecting you from your accommodation we travel to the Emu Ridge Eucalyptus Distillery, a marvelous example of dinky-di Australian bush ingenuity. Feed Kangaroo Island kangaroos at Parndana Wildlife Park, spot koalas relaxing in the Eucalyptus trees at Hanson Bay Wildlife Sanctuary and visit Flinders Chase National Park. Walk along boardwalks to the spectacular Remarkable Rocks and Admiral's Arch. You will return to Adelaide this afternoon via ferry & coach. KANGALUNA CAMP AND WILDLIFE - On arrival at Port Lincoln you’ll be met by your tour leader. First we visit a colony of wild koalas at Mikkira Station before traveling through farming land to Wudinna, population 600, stopping for lunch along the way. We will pass Wudinna Rock as we travel into the outback to Kangaluna Camp. The afternoon tour begins our wildlife experience, the outback animals thrive in this environment. We expect to see three species of kangaroos as well as emus and many birds, returning to Kangaluna after sunset drinks at Kolay Mirica Rocks. Overnight at Kangaluna Camp with a bush dinner. Visit an ochre pit on the morning drive to spectacular Lake Gairdner, with its glistening white salt pan set in the red landscape. Here you can walk on the surface of the lake and look north to see the endless white plain and the striking red surrounds and islands. The red dunes along the lake yield many animal tracks, flowers in spring, interesting vegetation and birds. Photo opportunities are endless. Afternoon we drive through a changing landscape, cigar shaped volcanic rock formations 1600 million years old, and lots of wildlife. You may see emus and red, western grey and euro kangaroos as we drive through the ancient outback range to Kangaluna Camp. Early morning drive to Baird Bay we will board the boat for an unforgettable wildlife experience. On the 3 mile journey to a lagoon at Jones Island near Cape Radstock (one of the highest sheer points on the southern coast of Australia) you can watch Bottlenose dolphins ride the bow wave of the boat, and join these magnificent mammals in shallow water. Cross the bay to visit a resident colony of rare Australian sea lions and experience playing face to face with these agile and friendly mammals as we wade in protected shallow lagoons. You may very well be smooched by these animals. After lunch on the beach we leave Baird Bay and visit Venus Bay, Elliston and enjoy magnificent coastal scenery on the journey to Port Lincoln. Cairns is the heart of Tropical North Queensland and is the primary gateway to Northern Australia & the Great Barrier Reef. Cairns is framed by the spectacular twin backdrops of rainforest mountain ranges and the sparkling Coral Sea. It is a modern, sophisticated city, and is an ideal base to explore the wider Tropical North Queensland region and the World Heritage listed Reef, Rainforest and Outback. Overlooking the marina, the beautiful Cairns Harbor Lights Apartment Hotel is situated on Cairns’ stunning waterfront with major shopping, transportation, restaurants, cafes and tourist areas all within easy walking distance. The rooms have a luxurious, contemporary feel with views overlooking the marina, Marlin Parade or parklands, where you can enjoy the colorful sophistication of tropical North Queensland. Today you’ll journey to a reef at the very edge of Australia's Continental Shelf, to an underwater world that is a dazzling kaleidoscope of color and brilliance. Agincourt Reef is a magnificent ribbon reef where you can experience firsthand the magic that is the Great Barrier Reef. You can choose to dive, snorkel, or stay dry and explore the stunning reef from the comfort of a semi-sub, just one meter underwater. Watch the fish feeding from a unique underwater viewing platform and underwater observatory or fly in a helicopter (additional cost) over the reef. Whatever you choose, this will be a day to remember! Includes morning and afternoon tea, Reef presentation by marine biologist, hot and cold tropical smorgasbord lunch, all snorkeling equipment, qualified snorkeling safety officers on hand, underwater observatory fish & coral viewing, coral viewing by semi-submersible vessels and fish feeding (conducted by crew). Sick and injured sea turtles are brought into the Cairns Turtle Rehabilitation Centre from the Great Barrier Reef and Cape York Peninsula. Here is your opportunity to assist volunteers in a sea turtle’s recovery. The most common turtles we see through the rehab centre are the Green turtle and Hawksbill turtle, these turtles can stay in the centre anywhere between 6 to 24 months until they are healthy enough to be released. Many of the turtles are brought into the rehab centre with an illness called ‘floaters syndrome’ which is an obstruction that occurs in the turtle’s gut causing air to become trapped between the shell and the body, impacting the animal's ability to dive down to the sea grass beds in order to eat. If these turtles are not found they end up starving to death. Some turtles suffer horrendous injuries from entanglement in discarded fishing nets At the rehabilitation centre the turtles are fed daily, the tanks are cleaned and medication administered when required. Once the turtle has made a full recovery, a satellite tracker is attached to their shell and we follow the movements of the turtles. Currently there are 20 volunteers working at the centre. 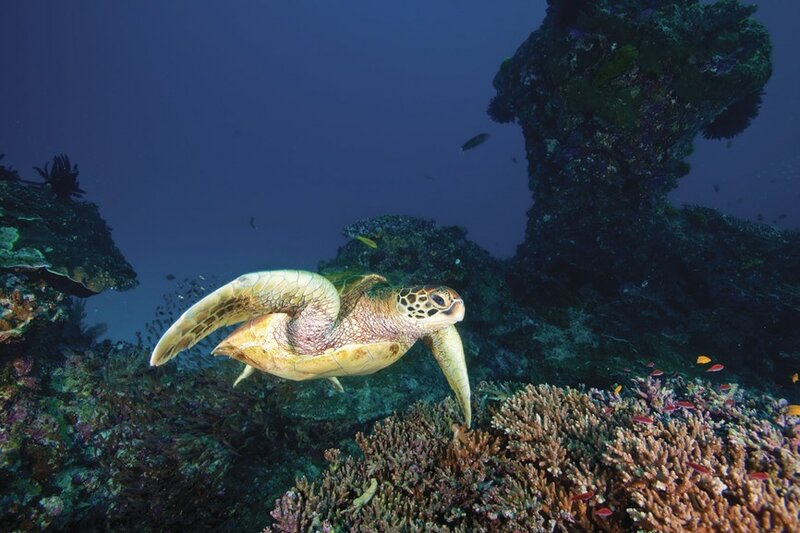 The success rate for the rehabilitation of the turtles is now 85% and is now one of the highest success rates in Australia.